Classes at paper THINK tank are held on a monthly basis. 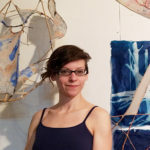 Nicole is also available for demonstrations, one-on-one or group tutorials, and special workshops (with a mobile papermaking studio). In a watermark, light passes through paper to reveal a design or the symbol of its maker. In this workshop, participants will design their own simple watermarks (using only pencil and scissors!) to create imagery in their sheets of handmade paper. 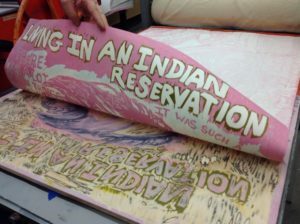 Using finely beaten pigmented paper pulps, the watermarks will be revealed and can also be made more visible by double-couching a white sheet of handmade paper on the back side. 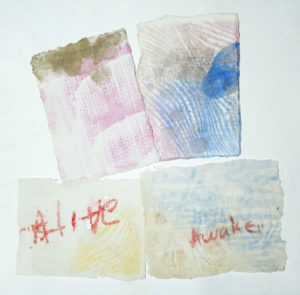 This is a one-day workshop, spent in the wet studio, and will introduce students to the methods and materials of Western papermaking and watermarking with stencils. Students will create up to 10 sheets of handmade paper, including blank sheets. Wet paper takes approximately 24 hours to dry. All dry sheets will be returned to the students via USPS within one week (unless other delivery/pick-up is arranged). DAY 1 at paperTHINKtank Using abaca, cotton rag, and kozo fibers, Papermaking for Printmakers will introduce printmakers to some of the best fibers for woodblock, etching, and combination printing techniques that utilize chine colle. This first day is spent in the wet paper studio. Participants will make up to 10 sheets of handmade paper ideal for various printing techniques. Then, on May 12th, DAY 2 at Second State Press, Andrea Santos will teach students a variety of printmaking techniques for their newly made paper. I’m pleased to be offering a one-week intensive during the annual PBI at Ox-Box! Delve DEEP into pulp painting and sculptural paper practice. Participants will begin with basic sheet formation using low and high shrinkage pulps, and will pigment small batches of finely beaten pulp for use as pulp paint. 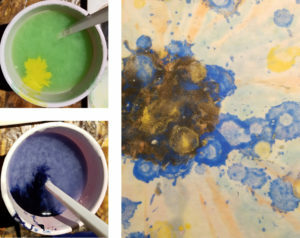 We will cover principles of color theory and learn to manipulate pulp paint. 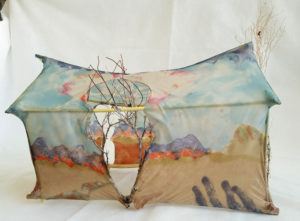 We will then shift our focus to constructing three-dimensional forms using a combination of natural and found materials. Our still wet pulp paintings will be applied to the sculptural forms, where they dry and shrink around the form, revealing areas of translucency and opacity. Paper and Book Inten­sive is an annual work­ing sab­bat­i­cal in the book arts, paper­mak­ing, and con­ser­va­tion for sea­soned prac­ti­tion­ers and moti­vated beginners. The courses offered here are taught by leading artists and craftspeople in the country. I hope you can join us there! In this one day papermaking workshop, participants can make as much paper as their heart desires! I will prepare 3 different pulps based on participant feedback, usually two opaque pulps and one translucent/high shrinkage. Make sheets of paper from letter-size up to 11×17″ for your next artistic and/or crafting project. Participants should have some papermaking experience. Learn how printmaking techniques can transform your images into handmade paper! First we’ll learn to make sheets of handmade paper from different fibers. 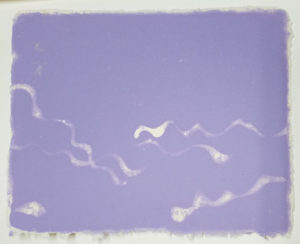 Then, we will add pigmented paper pulp through various stencil printing techniques including screenprint. Using your own images and words, we will create acetate stencils to transfer them into handmade paper. You can combine and rearrange stencils and incorporate collage and layering techniques to create a variety of handmade paper sheets that are unique pieces of art. Special workshops can be arranged for groups of students at paperTHINKtank or brought to your organization. Contact me for any requests, special/advanced topics, or open studio time. Payment is due at time of registration to ensure your spot in the workshop. Minimum enrollment must be reached seven days in advance for the workshop to run. No refunds are available for cancellations made within a week of the workshop.